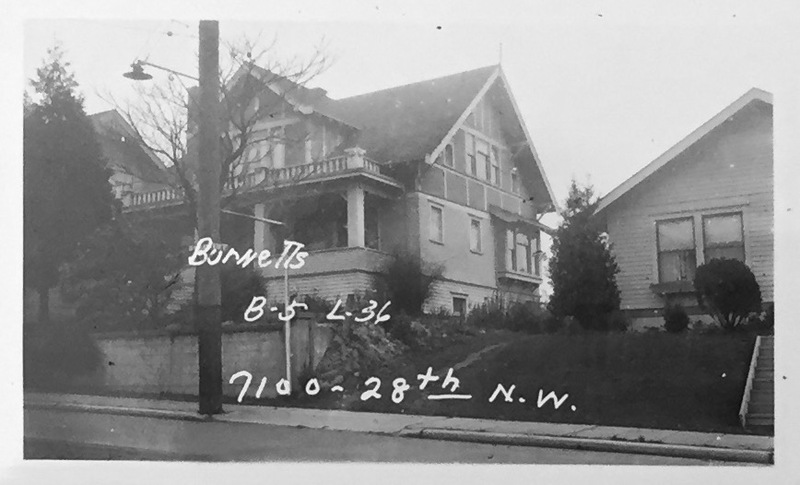 This Craftsman type house was built in 1912 in the Burnett Sub division of Seattle on lots 35-36 and part of 34 in Section 5 for owner Mr. Sumarlidalson by contractor Paul Peterson. Its address at the time was 7104 NW 28th. Since at least 1907, the local Streetcar transportation system through Ballard (now Seattle) ran west along 67th Ave NW turning North onto 28th NW which would have run directly in front of their house for easy access to Ballard business and links to downtown Seattle. With Daniel Webster Elementary school just blocks away, this property and home would be highly desirable for raising a young family. As per the 1920 Census, its address may have been changed to 7106 and two families lived there. In the front was part owner Kate Zeldensust with no husband, her five daughters and one son, along with two boarders. In the back were the other part owners Mr. Grobschimt and his wife and one son. From the 1930 through the 1940 censuses show Karl Frederick as owner and his family consisted of his wife Mary/Marie, two sons and a daughter. Mr. Frederick, was born in North Dakota and was employed as a Superintendent of a Fish Cannery. As of 1940 MR. Frederick was a bookkeeper for State Garage. Other owners were Burt Claire Miller and Bulla (Glades) Miller then ending with Steve and Jennifer Nagel, the current owners. 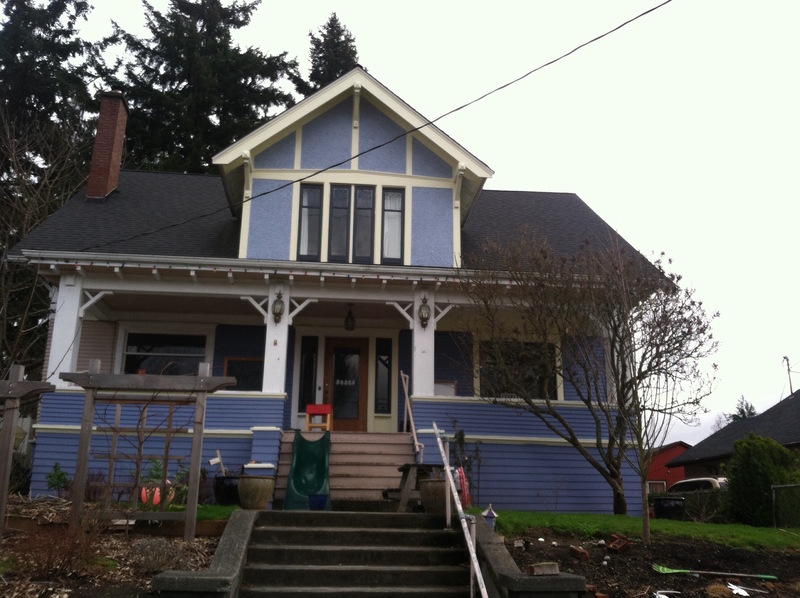 This 1-1/2 story cross gabled house exhibits both Tudor and Craftsman influences. Cladding is horizontal wood cladding on the walls and stucco with decorative half-timbering under the gables. Gables have triangular knee brackets below the eave overhang. A full-width receding porch extends across the front elevation and has 4 square columns with triangular knee brackets. At the center below the front gable lays the wood front door flanked by two slender vertical windows and a wide wood frame. At each side of the door is a wide transomed window. Front gable has a group of 4 slender windows with patterned upper sashes. The side (south) elevation has multiple windows and a shed projecting bay at the rear corner. Concrete stairs at the center lead to the elevated porch. A concrete low retention wall contains the uphill front garden. 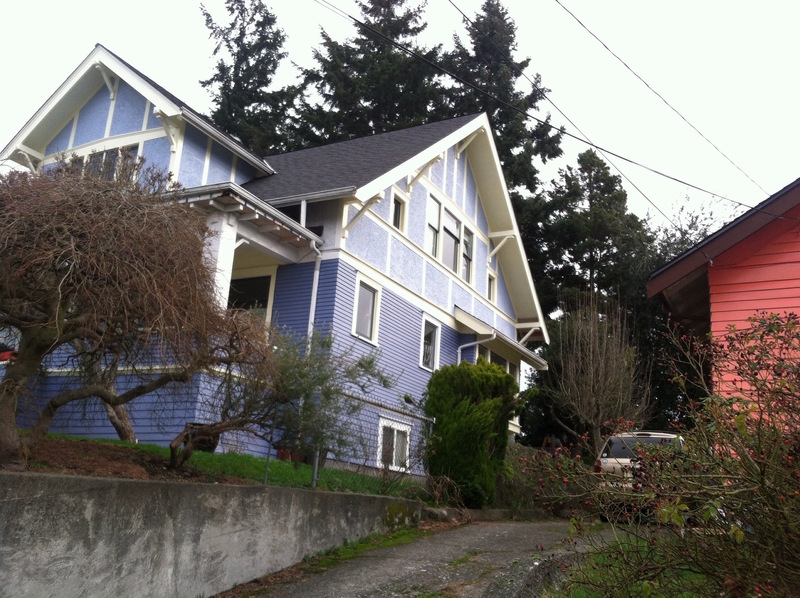 The house sits above the street on a mid-street lot facing west almost in front of an intersecting street. Historic photos suggest a balustrade used to top the porch.